Is Infosys lagging in IT recovery? Results of other top-tier IT services companies, such as Tata Consultancy Services Ltd (TCS), Infosys Technologies Ltd and Wipro Ltd, also showed that the worst is over, but almost seemed to miss out on the sharp turnaround in sentiment Cognizant talked of. The highest rate of growth was reported by TCS, which grew revenue by 3.9% in dollar terms, followed by 3.2% in the case of Wipro and 2.9% for Infosys. India-based players are exiting the slowdown phase with margins that are at multi-year highs. While this is largely a commendable effort, it also raises some concerns on the outcome of a lack of adequate investments in selling and marketing expenses. Cognizant, in contrast, has increased its selling and marketing investments. Among India-based companies, TCS and Wipro seem to be pulling ahead of Infosys in the past two quarters—a time when the Indian IT industry has been slowly clawing back from the depths of the post-Lehman crisis period. TCS has done much better in garnering volumes, with 3.6% and 5% growth, respectively, in the June and September quarters. In comparison, Infosys’ volumes fell by 1% and rose by 2.3% in the corresponding quarters. 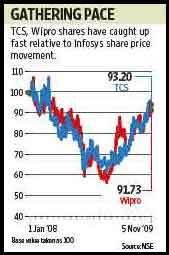 That’s a considerable difference, and if the trend continues in the December quarter, TCS shares could trade at a premium to Infosys, according to an analyst. Wipro hasn’t outperformed Infosys in terms of volume growth, but has contained costs aggressively. It reported an improvement in margins for the third successive quarter—a feat both TCS and Infosys haven’t achieved. Its margins in the IT services segment are now fast catching up with peers. With TCS outperforming in terms of volumes and Wipro in terms of cost containment, earnings estimates of both these firms have been revised by analysts. But those of Infosys have been left untouched, as results have broadly been on expected lines. For instance, Edelweiss Securities Ltd has increased the earnings estimates of TCS and Wipro by 7-10% for fiscal 2010 and fiscal 2011, but hasn’t changed those of Infosys, pointing out in a recent report that even consensus estimates for the firm haven’t been changed. This underperformance has been reflecting in its stock price as well this year. Of course, Infosys shares had outperformed those of others by a large margin in 2008, and it seemed that TCS and Wipro shares are playing catching up. But with their financial performance picking up a considerably better pace, the divergent movement may well continue.